BUENOS AIRES, Argentina, Dec. 17, 2018 /PRNewswire/ — Dulce de leche is an important part of Argentine culture, along with tango and soccer. Its creation dates from the start of the 19th century, in the early days of the nation, and it has conquered the most demanding palates from all around the world. Because of its versatility and flavor it is one of the most emblematic products of Argentine gastronomy: "Just as with meat or mate, it was positioned as a symbol and is growing abroad," said Alejandro Bertin, CEO and Director of Establecimientos San Ignacio (www.sanignacio.com.ar), a company with 80 years of history that was entrusted with taking dulce de leche to Japan for the first time. A recognized ingredient of Argentina´s Gastronomic Cultural Heritage it is served at all hours. It sweetens at breakfast and afternoon tea and is enjoyed in desserts or by simply eating a spoonful. Dulce de leche is used by Argentinians in toast, in cakes, and even fused whit classic French breads and pastries such as croissants, crepes or macarons (photo). It is extremely important in confectionary and pastries and also in the production of snacks, sweets or the renowned dulce de leche ice cream. It is prepared using milk, sugar, sodium bicarbonate, and unlike products such as hazelnut paste, it does not have high fat content. 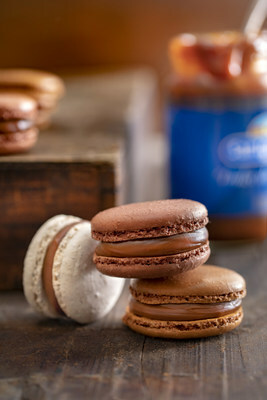 Since the company’s creation in 1939, San Ignacio has prepared its dulce de leche using the original recipe. In 1978 it took its products to Germany, a milestone that made it the first company to obtain certification to export to the European Union. Today it exports to more than 22 countries, and it is the main Argentine exporter. San Ignacio recently made its first shipment to Japan: it exported 3,780 glass containers weighing 1701 kilograms. "We know that this is the start of a dream. We want the Japanese people to understand the profound connection we Argentinians have with our dulce de leche, just as we have already done with the tango," Alejandro Bertin emphasized.